Connection Express was established in 1983 after MD Chris Malkin came back to Newcastle after working as a London courier. Our first jobs were collecting and delivering copy from typists mainly for the advertising sector. The company history. 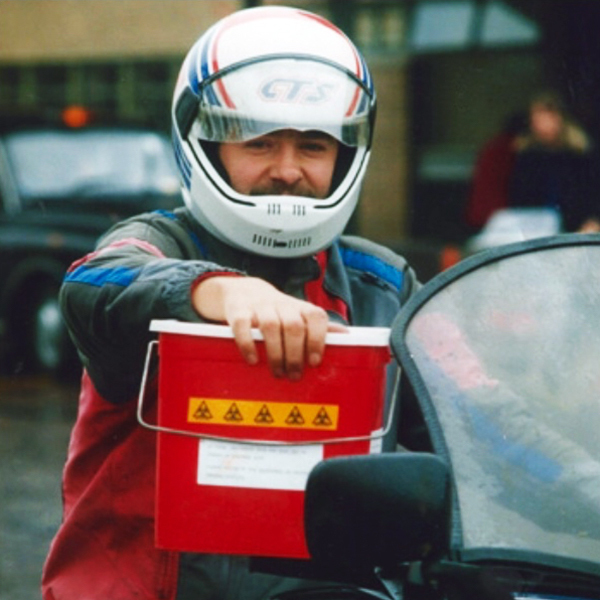 In 1989 Connection Express became the first courier company in Newcastle to offer a pathology courier service between GP and NHS labs. Specimens were carried by motorbike and car in special boxes. This specialist service developed and Connection went on to provide all the main NHS trusts in the region with a GP to laboratory express courier service. Although providing a specialist pathology service for the NHS Connection Express also offers same-day express deliveries to a wide range of local and UK business and industry. Connection express is very much a family business. Chris joined forces with his brother Alistar Malkin in 1987. In 1990 the company became a partnership and Fiona Malkin, Chris's wife, joined the team.